Instant Imprints St. Louis, MO | Custom T-Shirts, Embroidery, Signs and More! At Instant Imprints Westport in St. Louis, our customers come to us when they want to be more visible to their customers. We create that visibility five different ways: Branded Apparel (embroidery), Signs & Banners, Promotional Products, Custom T-Shirts and Print Services. Instant Imprints in Westport have done everything from creating eye-catching light up signs for our organization to Christmas cards to promotional mugs, pens, business cards and event invitations. They have been so helpful in putting idea's together for us from a simple picture and put what we've envisioned into a product or a sign. I would definitely recommend Instant Imprints to anyone needing promotional products. Are you looking to bring your brand visibility to a whole new level with custom t-shirts, printing services, promotional products, custom banners or branded embroidery items? Then come on by Westport Instant Imprints to have all of your promotional product needs taken care of! Whether you’re looking to promote your next event, push a new product or show off your business as a whole, there’s no better way than with the high-quality custom goods that Instant Imprints provides. Your products are made all under one roof, right here in St. Louis! Every business has different promotional needs and target audiences. That’s why at Instant Imprints Westport, we have a team of local Image Experts that strive to understand your project’s goals and help you every step of the way. If you have questions, we’re happy to help in any way we can. Just ask Siri, Alexa, or your Google Assistant, “Where’s the best print shop near me?” and you’ll be sure to find Instant Imprints Westport at the top of the list! Across Missouri, brand owners and marketing professionals know the power of a quality custom t-shirt. Our team of Westport Image Exports is at-the-ready to help you craft the perfect custom tee for your project. We have the latest in production techniques as well as the expertise to use them. If you have any questions about what t-shirt style is best for your project, our team of Image Experts is happy to help. In addition, if you’re looking for an even greater level of personalization, our custom embroidery service can take your style to new heights. Whether you want to reach your prospective customers on the sidewalks or the freeways, there’s a custom sign and banner solution that will get the job done right. With a wide variety of design options available, your business can stand out in a unique way. Our roll-up banners and trade show displays let you show off your logo wherever it’s most effective, and our sidewalk signs can help invite passersby into your storefront. 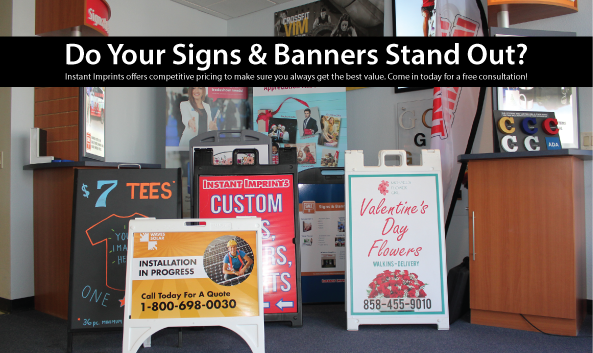 Our Westport Image Experts are happy to help you craft the perfect banner or sign for your business! When you’re ready to amp up your promotional power, stop in at our Westport Showroom, give us a call at (314) 733-5265 or request a quote online today!